What do Indian Myna birds look like? Indian Myna birds are brown with a blackish head. It has a dull and sometimes bright yellow bill, legs, and bare yellow skin behind the eyes. When the Indian Myna is in flight, a white patch underneath their wings and feathertails. 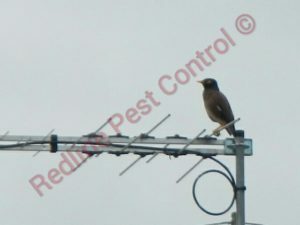 Juveniles are duller and more of a plain brown compared to adult Indian Mynas. Why are Indian Myna birds considered such a pest? Indian Mynas are native to India and were introduced to Australia around 1880 to reduce locust populations in agricultural areas. The Indian Myna bird population have rapidly and significantly increased over the years. Indian Mynas are actually ranked as number one of the world’s most 100 invasive pest species by the International Union for the Conservation of Nature. Lifts roof tiles and guttering to get inside to make nesting materials. Brings bird lice and mites that could seep through cracks and crevices. Bird poop is an eye sore. Damage roof tiles and other parts of roofs such as gutters, and facades. Why are Indian Myna birds so common in urban areas? What are some steps you can you do to deter Indian Myna birds from your yard? Seeds that are left out for native birds can attract Indian Mynas to your home. Do not leave pet food outside as this will attract Indian Myna birds to your home. Indian Myna birds love to nest in hollow trees, roofs, exotic trees, and the dead fronds of palm trees. To break the nesting cycle block holes in roofs and eaves and keep palm trees trimmed. Remove any pet bowls from outside as this attracts Indian Myna birds. Plant more native trees as it will bring more native birds that Indian Myna birds don’t get along with. What is bird lice and how do we get bird lice?